Irina Segal, M.A. is a licensed and certified Dr. Hauschka skin care therapist. She has over 25 years experience in natural home care, nutrition, herbs and lifestyle counseling and holds a Master’s Degree in Philology (Study of Literature, Linguistics, Languages) from the University of Saint Petersburg, Russia. She is a life long student of Anthroposophy, striving to recognize the truth in an endless stream of information and assisting her clients in their pursuit of beauty and health. Prior to focusing on Dr.Hauschka skin care, she was involved with Waldorf education, applying its insights to her curative work with children through water color painting and fairy-tale imagery. Her studies in Biography work provide Irina with an invaluable insight in challenging life situations. 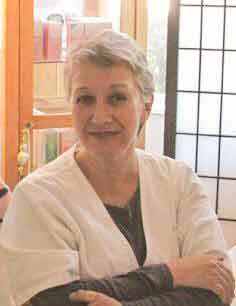 Irina has a calm and centered presence; her treatments are a renewing experience for body and soul. She is fluent in English, Italian and Russian languages. The Healing Rose is an official certified Green Business by the City of Los Angeles. We strive to use green practices in all aspects of our business including recycling, using green cleaning products and lighting, using recycled boxes, encouraging rideshare, and more. We operate daily with the environment in mind, doing our part to reduce our carbon footprint and promote sustainability.